This painting shows a hypothetical Anasazi domestic scene suggested by archaeological evidence at numerous prehistoric Southwestern U.S. sites, including Pottery Mound, New Mexico (see my reproduction of the Parrot Woman of Pottery Mound). Apparently a favorite Anasazi method of cooking a human body was to chop it into small pieces which could fit into a pot of boiling water. As the lumps of meat containing bone tumbled around in the boiling water, the bone rubbed against the insides of the pot and acquired a characteristic type of abrasion that archaeologists call "pot polish." Pot-polished bone fragments are a common find at Anasazi dig sites. Since the fragile Anasazi pottery could not withstand the intense heat of a direct flame without breaking, water in a pot was instead brought to a boil by dropping fire-heated stones into it. 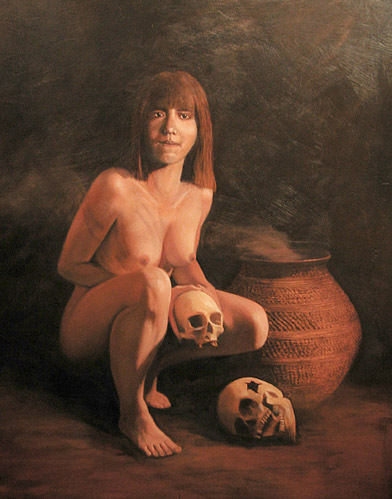 Normally a stickler for authenticity in a painting, I was not enthusiastic about painting bloody body parts, so I elected to give the girl in this painting some nice, clean skulls to handle after she had boiled them clean in her pot. At Casas Grandes in present-day Chihuahua, Mexico, archaeologists digging in the ruins of the city of Paquime discovered such skulls suspended by leather thongs from ceiling beams of rooms. Many of the skeletons discovered at Paquime showed the marks of butchering with stone tools.